This annual festival of lights falls on October 22nd this year, which is the 15th day of the month of Kartika in the Hindu calendar. One of the most important holidays of the year for Hindus, Diwali is celebrated to honor Rama, an incarnation of the god Vishnu, and to symbolize the triumph of victory over evil. Along with oil lamps and hanging lanterns to light the home, consider a dazzling display of dahlias to decorate the table or bring with you as a gift as you visit friends and family. Said to symbolize dignity in the language of flowers, colorful dahlias are the perfect flower for celebrating Diwali and are at their peak this time of year. In the ancient Hindu epic, the Ramayana, the story is told of Rama and his wife Sita’s return from exile and his defeat of the demon Ravana. Seen as the victory of good over evil, light over darkness, the lighting of small oil lamps around homes and streets is one of the ways in which Diwali is celebrated. Whether you are a practicing Hindu or simply happy to light a lamp to brighten up the darkening days of autumn, adding flowers such as dahlias in bright colors like gold, orange and pink are a perfect addition to an evening that is getting longer and cooler every night. 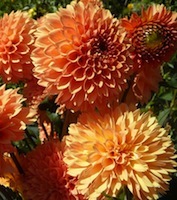 Dahlias are in the sunflower family and grow on hardy stems that range widely in size. From their perfectly round buds, dahlias open up into symmetrical blooms that can be as small as a silver dollar or as large as a dinner plate. Dahlias come in every color of the rainbow except blue, and many have more than one color- often fading from dark centers to lighter colors on the outer petals. Bright pinks and showy yellows are the colors for summer, but for this autumnal festival, consider the deep bronze, burgundy or golden blooms. They look amazing in vases with greens like fragrant eucalyptus or with dainty sprays of daisies or alstroemeria and accessorized with hypericum berries or other fall foliage. 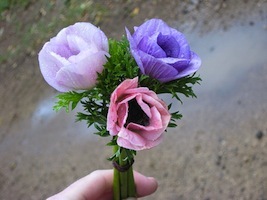 For Diwali, consider taking a bunch and trimming them just behind the flower heads to float in a glass bowl, or the small, clay diyas usually filled with oil and wicks. These are a great alternative if you live in apartments or dorms that may not allow lighted lamps and with plenty of water, will last for many days. Husbands, don’t forget that Diwali Padva falls the following day, so be sure to pick up a few extra dahlias for your wife!